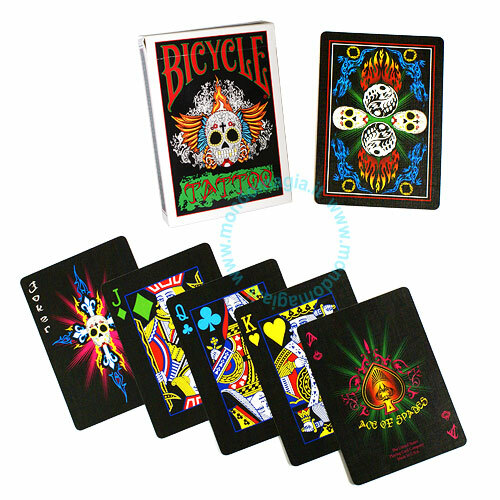 The Tattoo deck is an original design created by graphics designer and magician Stephen Rooks and expertly printed onto Bicycle Card stock by the United States Playing Card Company. The Bicycle Tattoo Deck represents a totally new look for a Bicycle Deck. Incorporating beautiful tattoo styled imagery and 6 colour print. A brand new, eye catching back design, new Ace Of Spades, Jokers, tuck case and bonus gaff cards. All cards feature a black background with the suits all being different colours: Clubs - Blue, Diamonds - Green, Spades - Pink & Hearts - Yellow. Each deck has a 3 of Spades reveal on the box bottom, also there is a flap reveal of the 5 of clubs. Limited Edition. Αυτό το προϊόν προστέθηκε στον κατάλογό μας την Thursday 05 January, 2012.